The UK’s first functioning solar panel park and could also take advantage of the new government-backed feed-in tariffs (Fits) incentive scheme, introduced last April. This solar park site, when under construction, will see 1500 photovoltaic, solar panels installed and could eventually generate up to 1.2MW in electricity at its peak. 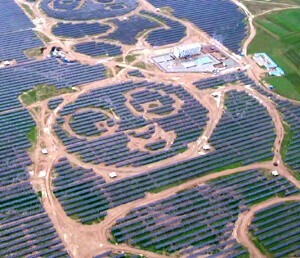 The new solar park will generate, and income with electricity using the Clean Energy Cash Back Scheme or as its commonly known, the feed-in tariffs (Fits), and as we will be able to use nearly all of the generated power on site for its business tenants, the annual returns are predicted to average more than 10%. “Any business or a homeowner installing these types of systems, will be able to use the electricity they produce and receive income from that, to maximise the financial return if they install within the next two years”, says Stuart Lovatt from Power My Home. You don’t have to have a significant roof space. The average output from a 1kW peak solar system in the United Kingdom is around 700-1000 kWh per year. An average home could easily generate 20 percent of its needs. Another example of this is The National Trusts carriage museum in Arlington is now generating its regular income following an installation of one of the UK’s most extensive solar system on a historic building. The 113m2 photovoltaic installation near Barnstaple in Devon will generate up to 6.3 MW h of energy per year, saving the museum about £600 from its electricity bill and creating an income of around £2270 per year by feeding solar energy back into the National Grid. It is a tiny time window of opportunity, so investing today, will mean maximising the benefits of solar energy.